A little while ago I was approached to help provide some background information to help with research for a one-off Radio 4 programme about Paddy and his life in and around Kardamyli which will be presented by John Humphrys. Kevin Dawson from Whistledown productions has confirmed that all is on schedule and the programme should be transmitted at 11.00 am on Monday 22 June. It will include interviews with Artemis Cooper and her father John Julius Norwich, as well as a contribution from the Benaki which may update us on progress about the house. John Humphrys has a property in the Kardamyli area and is a fan of Paddy’s work. I believe that this may be his own idea which is great and will go someway to making up the deficit of BBC programming about one of our greatest writers. This entry was posted in Paddy's Houses, Profiles of Paddy and tagged Artemis Cooper, BBC Radio 4, John Humphrys, John Julius Norwich, Kardamyli on May 28, 2015 by proverbs6to10. Having met Paddy from time to time, we had a look at the rather dilapidated reading room in August 2014 and I went up the steps from the sea cove and discovered a young Greek family in occupation of the main house. Locals were a bit discomfited when asked who they were: ‘Athenians’ was the reply. So I too will be interested to hear the Benaki’s response to concerns about what actually is happening to Paddy’s legacy, although fortunately the PLF Society is in touch with the situation. I hope I’m home in time to listen to this. .. I was in kardamyli recently and visited paddy’s house covertly. It is in a decrepit state, shutters rotten and falling off. Garden overgrown. Totally unloved and a disgrace, given that paddy gave e it to the Benaki Foundation to be used as a haven for writers. Hopefully this programme will shame the Greeks into doing something. They say it will cost over £100,000 to restore. Nonsense! He doesn’t have a son,….Paddy left it to the Benaki to look after. Can I listen in Australia? Oh, great! Thanks for the advance notice! It’s just a shame that things like this have to be down to the whim and personal connections of a BBC ‘star’ presenter rather than on the merits of Patrick Leigh Fermor’s legacy in and of itself. Yes, but when was the last time the BBC had much decent programming about _any_ great writers, even on Radio 3 and Radio 4, never mind on TV? If we all relied on the BBC to ‘educate, inform and entertain’ us, as they claim to do, then I don’t think any of use would ever get very far! More positively, working for good in the world as we find it, maybe John Humphry’s personal whims might also result in Benedict Allen’s ‘Travellers’ Century’ programme and interview with PLF getting repeated on BBC TV? I’m sure a few strings could be pulled! Andy is correct. 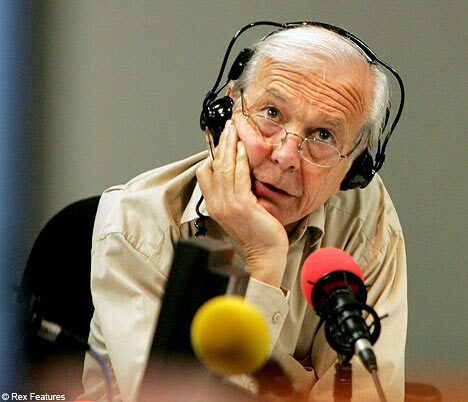 Hence Humphrys need to be shown round Mani. I wonder who he got to show him around. Perhaps a ruggedly handsome local publisher? One for the diary (and thank goodness for catchup)! I thought his property, co-owned by his son who play for an Athens orchestra, was on the coast near Epidavros. Perhaps he has more than one, but I expect I’d have heard if he’d bought in Kardamyli. I saw him once at Athens’ IKEA. It’d be a 3-4 hour drive, even with the new roads . . . I will be in Athens on June 22. Will I be able to get Radio 4? Will it be broadcast at 11: a.m. Athens time? I doubt it Fran, but you will probably have at least 28 days to catch up on iPlayer.